Your vacation begins “Where the Sidewalk Ends” - a wonderful beach house! Access to one of the best beaches on the east coast is within a minute’s walk. The house has 4 bedrooms and 3 full baths and three separate decks. One bedroom has a double/ twin bunkbed and a separate twin bed; the other 3 bedrooms have queen beds. 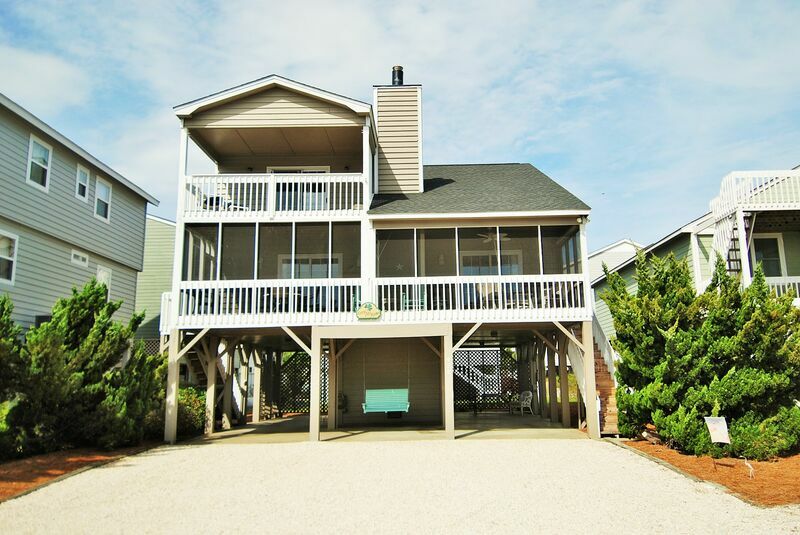 The two upstairs bedrooms have their own private decks, en suite bathrooms and hair dryers. The home is very well equipped both for cooking and relaxation. The bedrooms with queens have TVs, and there are TVs in the loft (along with a wet bar), and in the great room. All TVs have Roku for streaming and PlayStation Vue for cable viewing, plus you can access personal Amazon Prime and Netflix accounts. A trove of games is available for your group’s amusement and a little friendly competition. Other amenities include bedroom ceiling fans, washer/dryer, furnished screened in porch, an outdoor shower, a swing and a picnic table. Bring or rent your bed and bath linens. Pets and smoking are not allowed.